It took me over a week to organize and send out all the stuff I sold during the Firesale (if you've been waiting, it's on its way, sorry!). The first thing I had to do was find and organize all the different gadgets I had and the booklets, wires, peripherals, power supplies, driver CDs and more that went along with them. I was losing my mind for a while until I finally snagged a bag of Ziplock baggies from the kitchen. Wow. That's the answer, man, I can't believe I've never seen it before. Ziplock baggies rule! God knows why, but I had this sense of "organizing" before, where I would get a new gadget and divide up the stuff in the box. The power bricks would go with the rest of the power bricks, the inevitable USB cable would get thrown in with the USB cables, the extra headphones would get tossed in with the other cheapo-in-the-box headphones, the install CDs would get stacked for easy access (even though I'd use them once if ever), and the boxes would get neatly stacked on the shelf in case I wanted to get rid of the thing someday. Well that someday came, and man, it was chaos. It took me HOURS to untangle cords, find discs, and generally organize the chaos that is my gadget closet. (Yes, I have a whole walk-in closet dedicated to my electronics, it's one of the wonderful bits of the The Little Yellow House that the office/spare bedroom has a big closet with shelves). I finally got everything that I was selling AND all the stuff I'm still using into their own little baggie, and I'm *so* happy. That is such a better way to organize this stuff! I had no idea! Trust me, I'm telling you, this is the way to do it. When you get a new gadget, only take the stuff you actually need out of the box. I have a pair of very expensive Shure headphones, I don't need any of the ones that come with the new handsets I buy - so leave them in the box. Along with the manual. Want to read it? Go download the PDF, leave the shrink-wrapped one in the box. 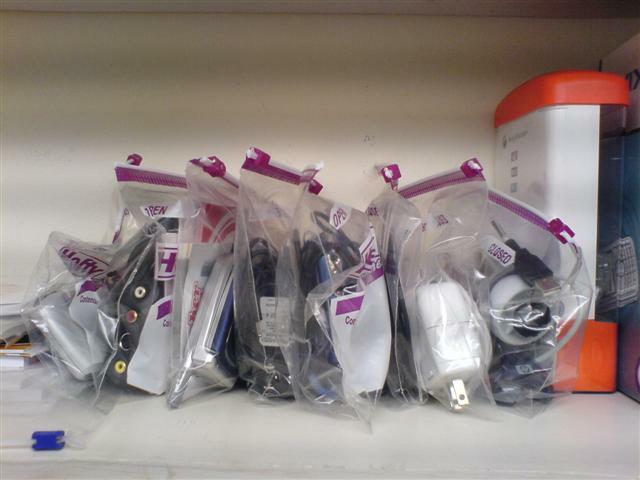 The stuff that you decide you do need (plug, CD) put in a baggie, in a shoebox or on the shelf. If you don't want to keep the original box or plastic packaging around (it is really a waste of space, I have to say) then toss everything in the baggie. As ridiculous as it sounds, the baggies actually take some shape with the little manual in them, and look good. Almost like old-skool homebrew discs. Didn't BBS Software get distributed like that for a while? I put a little picture up of what my shelf looks like now with the baggies. MUCH more organized. It used to be a rats nest of cables in a box. It's now much more accessible and neat. Who would've known? Email me if you're interested in of the above - I'm selling everything for half-off what you can pay for the devices online, you pay for shipping, paid via PayPal.